#15 Terriers rebounded from two lackluster losses to Northeastern by dominating #8 New Hampshire, 4-0, behind 29 saves by redshirt sophomore Max Prawdzik. It was the first collegiate start for Prawdzik, who spent second semester of last season with NAHL Lone Star, leading the Brahmas to the league’s Robertson Cup championship. Displaying the strong play that had led to wins at Quinnipiac in October and last weekend against Providence, BU received even-strength goals from freshman Ty Amonte, sophomore Dante Fabbro and juniors Jordan Greenway and Bobo Carpenter. Fabbro, a 2016 Nashville first-round draft pick, finished with a game-best +4. Amonte opened the scoring midway through the first period with a shot from the bottom of the left circle following passes by sophomore Patrick Curry and graduate student Drew Melanson. The lead was doubled early in the second period when Fabbro’s shot from the right point found its way through a maze of players and past Wildcat goalie Danny Tirone. Eight minutes into the third period, Tirone stopped a wrap-around attempt by Brady Tkachuk, but Greenway drove to the net to snap home the rebound for his second goal in the past three games. Carpenter also had an assist. Carpenter closed the scoring at 13:28 firing his seventh goal of the season top-shelf from the left circle, with assists to Tkachuk and freshman David Farrance. Andover, Mass., native Prawdzik became the first Bay State native to start a game in goal for BU since Rick DiPietro. 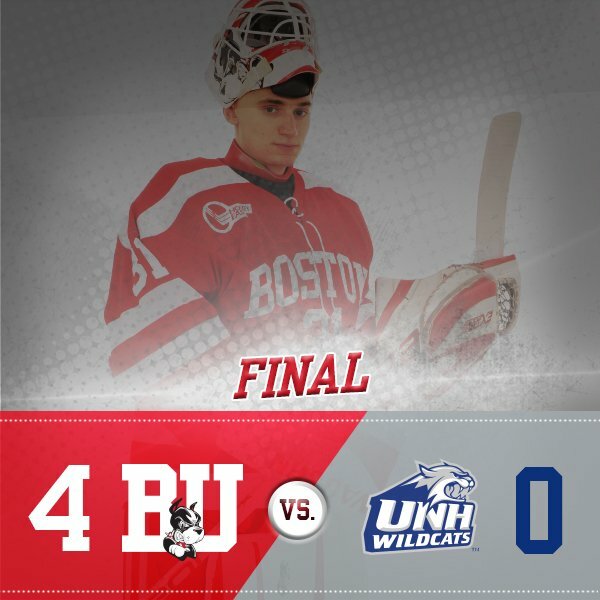 He also became the first BU goalie to pitch a shutout in his college debut since Sean Fields blanked Merrimack, 3-0, 17 seasons ago. - Overall, the team played a much more cohesive game. The breakout and neutral zone plays were noticeably improved from recent games. The team made the short passes to push the puck up and keep the pressure on the defense. The first and fourth goals showed the sort of offensive flow that this team has been lacking. - What a great night for Max Prawdzik. This was not an easy shutout. He seemed poised and trusted his defense to clear out rebounds (which they did well all night) by getting aggressive on shots from further out. He had one memorable right pad save in the second period that was absolute robbery. - I thought Farrance showed he should be in the lineup every night. He was the best skating defenseman last night and I think his willingness to go to the net adds an element to the offense, as happened on Carpenter’s goal. - Fabbro had another strong game. Through the ups and downs, I think he has been the most consistent Terrier. Especially with Hickey out of the lineup, the team is relying on him. - I really liked having Greenway and Tkachuk on the same line. UNH struggled to contain them. - Max Gildon is the real deal. 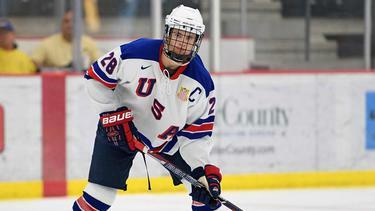 Smooth and poised with the puck, he quarterbacked the power play effectively. I thought he was their best player. 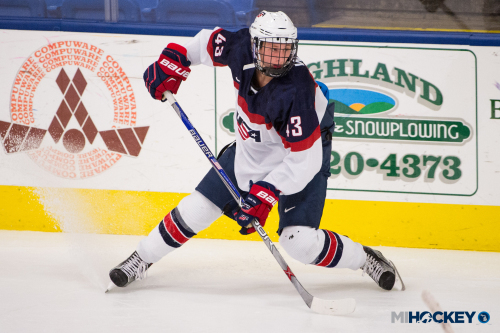 2018 recruit Joel Farabee had a hand in all three Team USA goals as the U18s dropped a 4-3 shootout decision to host Finland at the Five Nations Tournament. Farabee assisted on a first period goal, scored in the second and added another assist in the middle period. Team USA meets the Czech Republic on Sunday. Farabee is second on the U18s in scoring with an 11-10-21 line. 2018 recruits Tyler Weiss (photo) and Jack DeBoer combined for the game-winning goal in Team USA’s 3-0 win over the Czech Republic in their final game of the Five Nations tournament. After a scoreless first period, Weiss took a pass from DeBoer and fired home a shot from the left faceoff circle. 2019 recruits Trevor Zegras and Case McCarthy each had two points in the Team USA 9-1 win against Canada White in the World U17 Challenge semifinals. Wearing the captain's C, Zegras scored a first period goal, assisted by McCarthy, who also had a second period helper. Zegras assisted on a third-period power play goal. In the World U17 Challenge championship game, 2020 recruit Alex Vlasic scored a goal as Team USA defeated Canada Red, 6-4. Vlasic, McCarthy and Zegras all earned gold medals for the U.S. squad, which last won this tournament in Jan. 2014. Kevin Shattenkirk’s power play assist extended his scoring streak to seven games, during which he’s tallied ten points (3G, 7A), as the Rangers won their sixth straight contest, defeating Edmonton, 6-4. 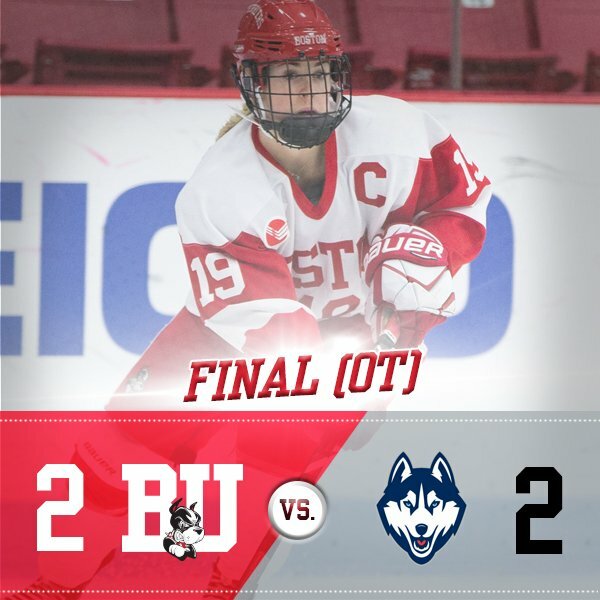 Senior captain Rebecca Leslie’s extra-attacker goal in the final minute of regulation gave the Terriers a 2-2 overtime tie with Connecticut on Friday at Walter Brown Arena. BU had taken a 1-0 lead in the first period when sophomore Natasza Tarnowski converted a centering pass from sophomore Abby Cook. UConn matched that goal in the second period and took a 2-1 lead eight minutes into the third period. Freshman netminder Corinne Schroeder turned aside 23 Husky shots for the win.